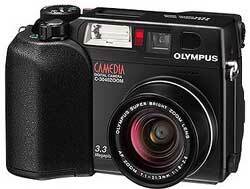 For me, the Olympus 3000 is one of the best digital cameras made. The Olympus 3000 combines many great features into an easy to hold package at a reasonable cost. But this camera excels at the most critical aspect of any camera -- the very purpose you buy a camera -- to get great pictures. The rest of this review goes into greater detail, but if you are considering the purchase of a 3000, you should stop now and buy this camera (or one of its close relatives, 3030 or 3040). I have personally recommended this camera to several people and everyone has loved it. If that doesn't convince you, let me tell you that I am very willing to shoot this camera against any other camera in a variety of extreme lighting conditions and be totally confident that I will get a quality picture. This was the first digital camera that actually made me think about artistic vision. Now I consider photographic elements like depth of field, motion blur and differing contrast, instead of simply hoping that I can get a decent or usable image. Now I yearn to create an image that looks better than reality. The most important feature of any camera is picture quality. If a camera doesn't take great pictures, it doesn't matter how cool it looks, what color it is or what kind of media it uses -- cameras are tools to take pictures -- not to make fashion statements! The Olympus 3000 gets this job done well -- I was very impressed by the capabiliuty of this camera in a variety of situations ranging from full sun to harsh trade show lighting and even nightime photography. In fact, the ability of the Olympus 3000 to take good night shots (400 ISO) revived my interest in nighttime photography. Most digital cameras are good at taking pictures on a sunny day, but they take lousy pictures at night. Another great feature of the camera is its numbering system. While most people probably don't care about this, if you take hundreds of pictures on a trip, unique numbering is essential. Most cameras use an incremental numbering system only, but Olympus has added the month and day to this number as well. This forces your images to have unique numbers, even if your image number gets reset back to one the next day. (While the same number may occur a year later, each image from your trip will have a unique number and can be stored in a single subdirectory.) This Olympus numbering system is also quite useful if you transfer your images via FTP which can end up altering the file's date and time. Now you can always tell what month and day you took the picture, since it is part of the filename. More macro capability -- I want what I had with my Bolex Super 8 movie camera, where I could focus on the dust on my lens. Better sound clip capability - give me a few seconds to think about how I want to annotate each shot, instead of starting the recording immediately after I click the shutter. 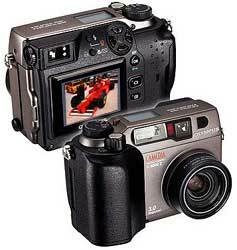 Internal flash memory or microbattery to preserve camera settings without requiring battery power. If a microbattery were used, the date and time could be accurate without requiring 4 AA cells to be in the camera all the time. Learning how to set the desired default camera modes isn't easy. For the first few days I used it at a trade show, I handed it to Olympus staff to help me set it. Sometimes it was difficult for them. I finally took the time to fully understand this camera's capabilities and now that I completely understand it, the camera powers up in the exact configuration I want. 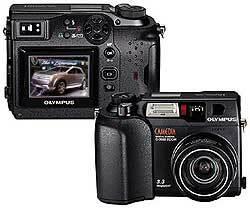 Let me restate this -- The Olympus 3000 lets you set your OWN defaults for the camera that includes flash setting, manual mode, ISO value and picture mode. Many other digital cameras require you to set these each time you turn the camera on. You can easily lose your lens cap. The Olympus 3000 and 3030 lens cap is a separate item without any hole to attach it with. You will have to tape your lens cap to a string or you can lose it. Everyone who saw my father's duct tape and string creation wished that they did the same thing, before they lost their lens caps. In spite of this list of changes and problems, I have taken several thousand pictures and was never disappointed (this doesn't mean all the shots were perfect, but I was able to quickly re-shoot and get the shot I needed.) Therefore, I highly recommend the Olympus 3000 (and its family members -- the Olympus 3030 and 3040).